We’re getting an extremely rare look at President Franklin D. Roosevelt walking. The Pennsylvania State Archives released an eight-second video of him yesterday. It’s from the summer of 1937 and shows President Roosevelt walking with an assistant as he arrived to watch an all-star baseball game in Philadelphia. It’s one of only two known clips of the president walking. 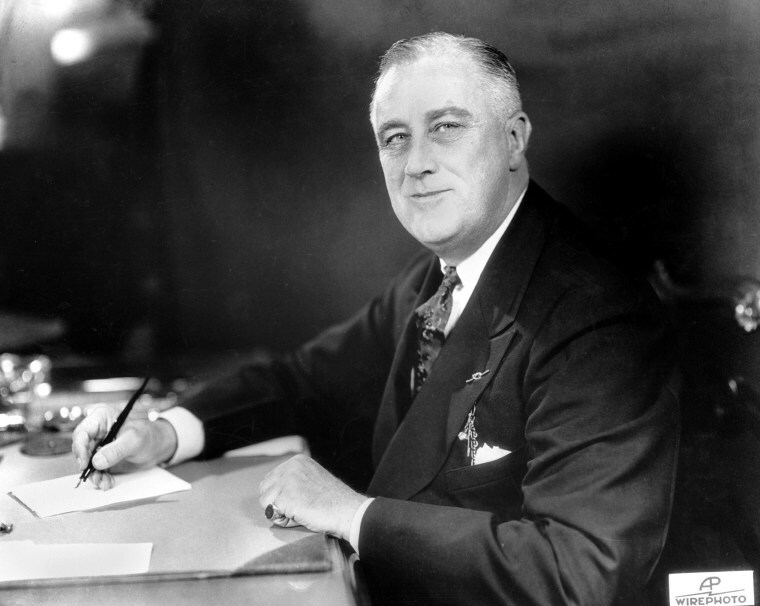 FDR was diagnosed with polio in 1921 and tried his best to hide his disability from the public. The social network best known as a place where people can share wedding ideas, cake recipes and design inspiration is now valued at $5 billion. After raising $200 million in a new round of fundraising, the online scrapbook site has joined the ranks of other start-up superstars like Airbnb and Dropbox, both of which recently attained valuations nearing $10 billion. Pinterest has begun dropping hints about what direction this money will take them in, such as building out a search platform and expanding their Promoted Pins. To date, Pinterest has raised $764 million since its launch in 2010. That’s a lot of mason jars. Life in the 1930s was so far removed from what we’re used to today. Then, a quiet drive through the countryside was entertainment. The grandson of an English couple got a good reminder of that this week after stumbling across lost photos of his grandparents’ honeymoon in 1939. Barney Britton was cleaning out his grandmother’s attic when he stumbled across the rare color photographs. They were snapped right before England entered World War II and are quite beautiful. What does it take to become the world’s fastest texter? You have to type sentences like: “The razor-toothed piranhas of the genera Serrasalmus and Pygocentrus are the most ferocious freshwater fish in the world. In reality they seldom attack a human.” Spelling and punctuation count. A teenager from Brazil did just that. Marcel Fernandes Filho set a new Guinness World Record on his Samsung Galaxy S4 with an impressive 18.19 seconds. The 17-year-old started perfecting his inhuman texting speed after he destroyed his computer in a fit of rage because “the monitor was flickery.” He didn’t have the money for a new computer, so he had to start using his iPhone for everything. Don’t try that at home, kids. With Godzilla set to hit theaters today, a lot of people are excited, especially in the Bay Area. This week, someone hacked into an electronic traffic sign in San Francisco and posted an alert that says “Godzilla Attack” and “Turn Back.” Well, that’s one way to get a driver’s attention. A National Geographic photographer has captured the incredible bond between America’s troops and their combat canines. But it’s not all fun and games. Military dogs play important roles on the battlefield, and they’ve contributed bravely on the front lines for centuries. At the height of the wars in Afghanistan and Iraq, the U.S. military had a force of about 2,500 military working dogs, and many became heroes in their own right. NatGeo’s June issue highlights some of the relationships between soldiers and dogs who endured the horrors of war together.